:: M M V I I ::: Tea Anyone? Why photograph a box of tea? If you read the small print near the base you'll see that it says "Supreme Monkey Pick Oolong Tea". MB has visions of an exalted monkey picking tea on the verdant hillslopes in Oolong. This monkey could even wear a saffron robe and tell your fortune by reading the tea leaves. Or is there a labour shortage in China and monkeys are being trained to replace humans? The mind boggles. The tea is actually very, very good and MB is very fortunate to have the most gorgeous sister-in-law who always remembers to send her gourmet teas. 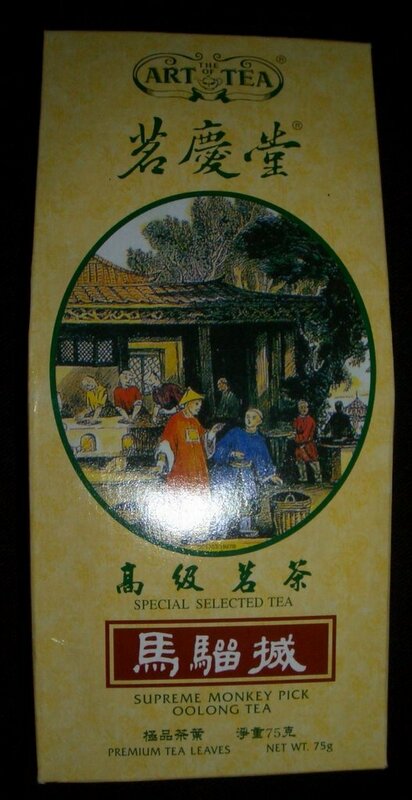 Which of course reminds me somewhat of the famous Bai Lin tea, as marketed in the 80s by that pure entrepreneur Peter Foster (also famous for "thigh-reducing " cream and dating Samantha Fox). At least he was a truly international Australian - jailed on threee continents! BTW, as a 'Hooks fan, do you check out this for updates ? Hey thanks Blues for the link, I hadn't seen it, in my favourites now. That is so funny. I can picture a monkey packing the tea into the boxes....lol.